The property has been in the family for almost 100 years & has just undergone a total renovation accompanied with a modern extension. The house has kept its authenticity while it gained in comfort and space. The large master bedroom has a sitting area & an en-suite bathroom including a black slate tiled Italian shower, a bath & a toilet. The second bedroom is also quite spacious, has its little sitting space & its en-suite bathroom with a toilet. The kitchen is brand new & has everything to cook & entertain. The new addition is a very light, modern & airy room with a mezzanine above it on 2/3rd of the surface which gives volume & light. The mezzanine is a perfect area to retreat & enjoy the peace. This area really makes the place. It combines comfort & good taste with modern design while the original granit stone wall keeps the spirit of the 'old' house. The south facing little garden and the teck deck allows to enjoy a BBQ or simply enjoy the nice weather as it's very protected. The up-stair bathroom has an Italian shower and a separate bath. Local black slate has been used to tile it and exotic wood for the floor. The downstairs bathroom has a shower and a toilet and has 2 accesses in order to be used privately for the bedroom or as a downstairs toilet. The house and its equipment has not been set up for rental. 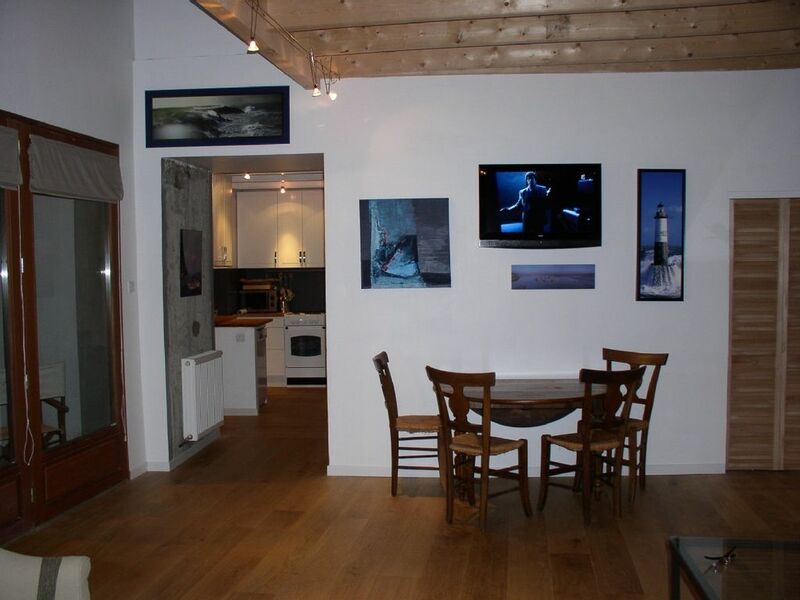 It's very much used by the owner and therefore has anything needed for a comfortable stay. We were so impressed will all aspects of the house and the lovely village. We would love to return. Every thing went so smoothly during the week here. The owner Vero obviously takes great pride in her house and has really focused on customer service, well done. Loved the village of St Pierre and were please we stayed here rather than the busy tourist town of Quiberon. The coastal walk around the peninsula was a great experience. We spent a wonderful week in the cottage. It is modern, bright, tastefully decorated and cosy. It is 100m from a beautiful quiet beach, and 400m from the town with great butchers, bakers, a convenience store, a great weekly market, and restaurants, creperies and bars. The area is flat and great for cycling. It is no distance to the Cote Sauvage, and with the exception of the main road, the roads are quiet. The bathroom is luxurious; the beds are comfortable; the courtyard is safe and secure and secluded for breakfasts and BBQs, and all it needs is a large pot to cook your own fresh lobsters and crabs from the seafood stall in the village. heavenly. I never ask for a review, so when I read this it rewards every effort I put in the house. Thank for having taken the time to write it. Regarding the lobster pot, there is one stored in the big cupboard on the shelve under the boiler. It's too big to be stored in the kitchen units. What a pity you didn't find it. It's too late now but I'll add the info on the house instructions for the next guests! A very comfortable cottage, with an excellent en suite master bedroom, good sized second bedroom and roomy, light living spaces. The cottage is tucked away on the edge of the village, but less than 5 minutes walk from a beautiful beach, with clean sand and safe swimming - ideal for families. The garden area at the front is very private and a real sun trap. Great walks in the local area and lots to see. The communication with Vero has been very easy and the whole booking process and holiday completely stress free. Reliable wifi and comfortable beds. Would highly recommend. We stayed at this fisherman's cottage in September 2010 for one week and loved every minute. The cottage is newly extended and renovated and is presented beautifully. The master bedroom upstairs is large, with a gorgeous walk in shower, separate bath, large sink and a toilet. The second double bedroom is also quite large, so large that we were able to place our 8-week old baby's travel cot in there easily. There is also a second bathroom on the ground floor with a shower, toilet, sink and washing machine. The kitchen is small, but functional and the living area very comfortable. The cottage is bright, but cosy. The location of the cottage is superb, less than 5 mins walk from the beach, village centre and a small number of restaurants. As we were out of season, on some evenings we struggled to find a restaurant that was open, but on those evening we made use of the BBQ at the cottage. There is a small garden at the front of the cottage, but it is enclosed by a wall, so it is very private. Maison spacieuse, fonctionnelle et charmante. Petit jardin bien exposé permettant de profiter des derniers rayons du soleil avant l'hiver ! Maison très bien située pour de multiples balades au gré des marées. Je ne demande jamais de commentaires mais ça me fait extrêmement plaisir de lire celui-ci! Ça récompense tous les efforts que je mets pour satisfaire les vacanciers qui séjournent à la maison. Si vous avez apprécié, alors je suis ravie. Merci d'avoir pris le temps de l'écrire. St Pierre Quiberon spreads on 2/3rd of the Peninsula, but the house is located in what is probably the best part of it. Close to the beach and the village, it has kept its spirit without getting damaged by ugly buildings. It's local beach is almost private and one of the safest one on the bay. Security deposit of 600 Euros. Any length of time is possible outside July and August. No additional charges.